Members of the Wrightsville Beach fire and police departments salute the flag during Sunday's observation of the Sept. 11 attacks. Staff photo by Terry Lane. 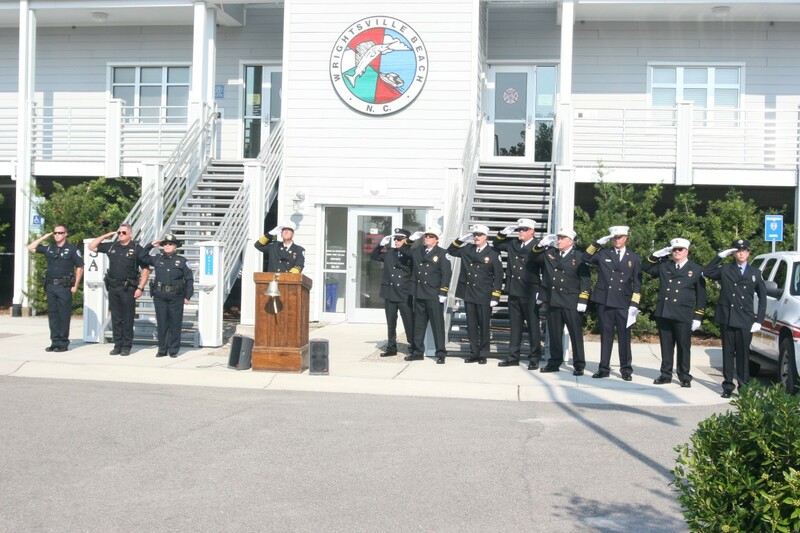 The public is invited to attend a Wrightsville Beach Community 9/11 Observance at the Wrightsville Beach Public Safety Building at 3 Bob Sawyer Dr. on Tuesday 9/11/2018 beginning at 9:45 AM. Firefighters and Police Officers will be performing a brief ceremony to honor the civilian, ems personnel, firefighters and police officers lost on that tragic day on September 11, 2001 in New York, Washington, DC and Shanksville, PA. This observance is jointly sponsored by the Wrightsville Beach Fire Department and the Wrightsville Beach Police Department. The service should culminate at approximately 10:10 AM.